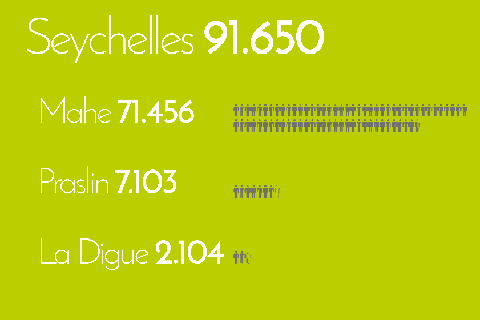 91.650 people live on the Seychelles. A large percentage of the people lives on the main island Mahé. The Seychellois have a life expectancy at birth of 74,25 years, an average age of 33,9 years and population growth per year is 0,87%. 20,9% are younger than 15 years and only 7,3% older than 65 years.